When retail management student Emily Slowey was in first year, she decided to focus her romantic attention to people in her residence building. It was convenient, but the selection wasn’t cutting it. Soon Slowey realized that there were people to meet outside her residence. Unfortunately the price of love included a Presto fare. Dating is hard enough, but on Ryerson’s predominantly commuter-based campus, where a majority of students transit in from neighbourhoods around Toronto, the chances that you’ll actually, physically have to go the distance for a relationship are pretty high. Slowey’s adjusted her dating perimeters after moving out of residence. “I think as time went on, I kind of saw that it was a hit or miss with people, and if someone who is worth it is out there I think it would be worth it to try,” said Slowey. While some Ryerson students choose to date exclusively within Toronto, or secretly base it on whether the person has an apartment, the school’s commuter population has forced people to get creative. Emily Mitri, a fourth-year nursing student, will switch up her work schedule with a coworker to meet her boyfriend. Occasionally, she’ll use a friend’s apartment downtown to hang out with him. Sometimes coordinating times just doesn’t work. For students commuting into Toronto, having a singnificant other who lives in the city kills two birds with one stone. Second-year performance acting student Mark Talman spends most of his time on campus instead of his home in Mississauga. He’s aiming for a relationship with someone in the city since it would be “convenient”, he said, especially if the person lived near the area he commutes from. But with housing prices on the rise in the city, fewer students are choosing to move downtown. Fourth-year child and youth care student Ashaana Burgher has a whole different strategy–the key, for her, is not meeting downtown at all. She’s dating someone in her hometown of Brampton, and instead of making him come downtown, she tries to find ways to have fun in the GTA. But beating rush hour can get hectic. “It’s hard to do when everyone’s on different schedules and trains get delayed,” she said. 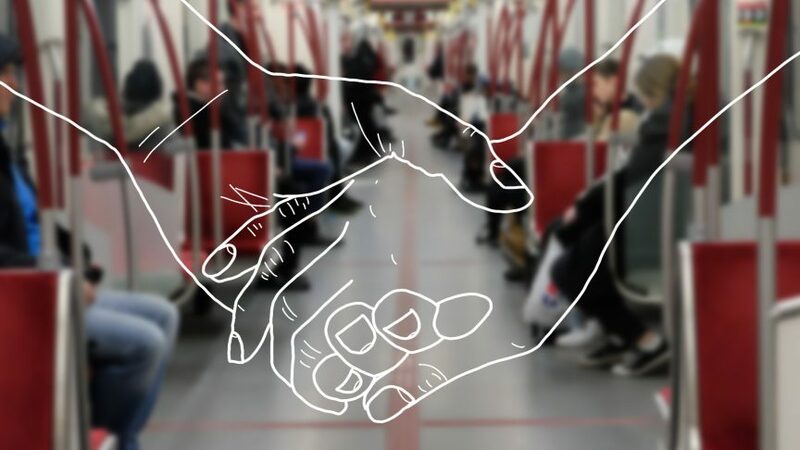 Regardless of the length of the commute, the location or the availibility of an apartment, one sentiment came up over and over again amongst Ryerson daters: sometimes the right person is worth the TTC fare. So don’t give up hope, Ryerson! Romance is possible on this dead, cold campus (or off it). You just got to be willing to tap your Presto for it.